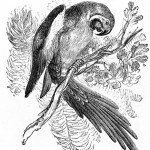 A collection of copyright free parrot pictures, drawings, and illustrations. 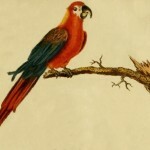 All of the parrot images in this group have been chosen for people searching for images for crafters. We won’t discourage anyone from using these great, vintage parrot images; but we are focusing the collection on those bird images that we believe have the best chance of being used by scrapbookers, mixed media artists, collage artists and anyone creating creative works. 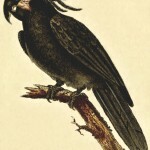 A stunning 1822 colored book plate showing a beautiful palm cockatoo drawing. These grey and red birds are found in Australia and New Guinea. The Cuban macaw or ara tricolor is sadly extinct but fortunately many drawings of these colorful birds are available for everyone to enjoy and admire. 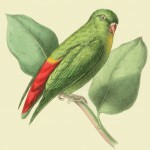 Free vintage bird image of a small green parrot. Edward Lear drew this Abyssinian parakeet drawing. These birds are also called black-winged love birds. 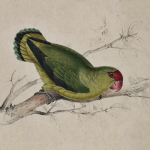 Vintage color bookplate of a green, red and yellow parakeet. 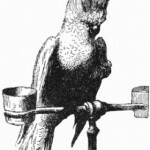 Drawing of a macaw parrot on a perch. While unlike his more colorful and stunning botanical prints, this parrot sketch by Fuertes has every bit as much charm and personality. A parrot appears to be screaming at something he sees from his perch. 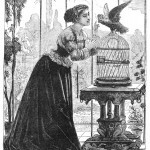 A pencil-like drawing of a parrot visiting a canary friend. 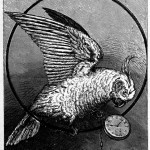 Drawing of a parrot who has stolen a pocket watch. 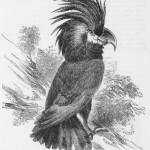 Vintage drawing of a striking Goliah Aratoo parrot. 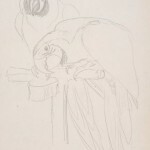 Vintage black and white drawing of a cockatoo being scolded. 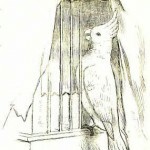 Vintage drawing of a cockatoo on a perch.